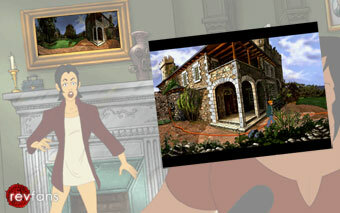 When you go to Professor Oubier's house at the start of Broken Sword 2, you see a lot of paintings on his walls. 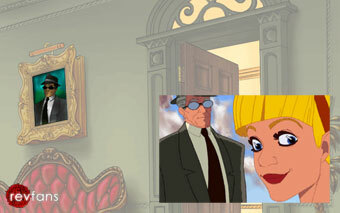 If you look closely, you'll see that two of these paintings are linked to Broken Sword 1. Thanks to Ciaran for pointing out the Plantard image. Being tied to a chair with a poisonous spider approaching fast isn't the type of situation you'd want to stay in. If you do hang around, and click on the spider twice, be prepared for your game to end quicker than it started! Fire the coal from the catapult you make on Ketchs Landing and see where it goes! Feed your lucky piece of coal to the goat in Quatamonte City and see what happens! This Easter Egg involves a bit of work. When you get to the London Underground station as Nico, use the hair clip on the vending machine's coin slot. A coin will drop, pick it up and put it back in the machine to get a chocolate bar. Walk to the right and you'll see a ghost floating there. It'll disappear as you walk towards it. Before it does, try and give it the chocolate bar. You wont be able to, but the Easter Egg has been unlocked. Walk to the left, where you'll be able to go down the left tunnel. Once you go down that way you'll see a scene from Beneath a Steel Sky. You can watch the scene (in Italian) on Google Video. Thanks to Francesco Miceli for recording and submitting this video. German fan, Paul Vida writes: "The ghost that can be found in the London Underground is actually the cold-blooded killer KAHN (a.k.a. 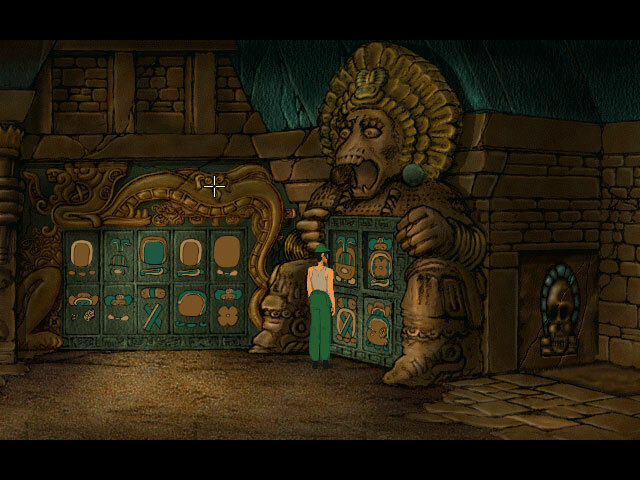 Thomas Moerlin) from Broken Sword 1. By looking closely (before the ghost vanishes) you can obviously see an old lady, but actually it's the same outfit Kahn wore at the end of the first game, while on the train to St. Ninians. Kahn was shot in the train (George Stobbart was the witness at his death), which explains the apparition of his ghost." If you talk to one of the Secretaries in the Quaramonte Mining HQ and ask about a Detonator, he will ask about Accounting Software, if you say "yes" he will explain the software is called LINC, a reference to Beneath a Steel Sky. Thanks to Joe for pointing out this reference. Once you've got the General and Renaldo to leave the police station in Quaramonte, click on the screen with (what looks like) Space Invaders on it. George will say it's a bad idea, but click on it again any way. The screen will go black and you'll hear George say "Uh oh! ", but nothing bad will happen. Thanks to Jack Gingell for sending in this trivia. Found another Easter Egg, or have some trivia about the game? Tell us!